Andy Dufresne (Tim Robbins) is sentenced to two consecutive life terms in prison for the murders of his wife and her lover and is sentenced to a tough prison. However, only Andy knows he didn’t commit the crimes. 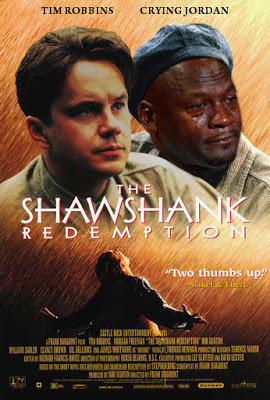 While there, he forms a friendship with Red (Morgan Freeman), experiences brutality of prison life, adapts, helps the warden, etc., all in 19 years.